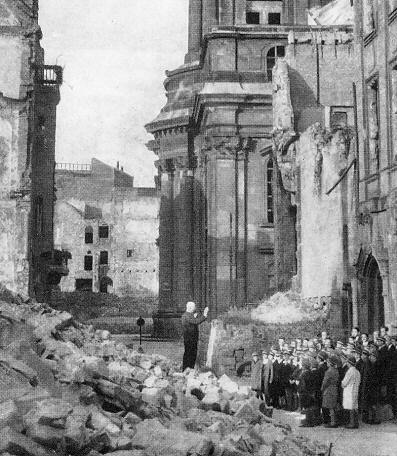 Eleven young choristers from Dresden's famous Kreuzchor were among more than 25,000 who died in the British and American bombing of the city on February 13th 1945. As well as the terrible loss of its choristers the famous choir, which is shown in a contemporary photo above, also lost its its neogothic choir school on the Georgplatz, its library of sheet music and archive, and its very raison d'être, the beautiful Kreuzkirche (Church of the Holy Cross) which dated from the 13th century. The history of the Kreuzchor dates back to the 14th century, and its reputation grew through the Reformation and into the 20th century. 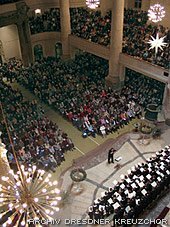 In 1932 Rudolf Mauersberger was appointed cantor, and the choir's reputation spread through its acclaimed performances of Bach's choral music in the Mendelssohn-Bartholdy tradition. The Kreuzchor made two tours of the USA in the 1930s before the outbreak of war in 1939 started the terrible events that ended with the carnage of 13th February 1945. Following the devastation Mauersberger was determined that music would literally rise from the ashes of the choir school and Kreuzkirche. 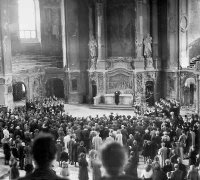 His first response was the composition of the heart wrenching funeral motet 'Wir liegt die Stadt so wüst' which was first performed by the Kreuzchor in the burnt-out shell of the Kreuzkirche on August 4th 1945, with Mauersberger using the rubble of the ruined church as a podium. (Photo to right.) We use the description 'moving' so glibly these days, but what must the young choristers have felt as they sang this lament not just for their destroyed city, but also for eleven of their own friends who had been killed just six months before? The composition of the choral cycle Dresden (RMWV 4/1), from which the funeral motet is taken, was followed by Mauersberger's masterpiece, his Dresden Requiem (RMWV 10). This was completed in 1948, but was revised several times with the final version dating from 1961. Although Mauersberger's reputation was built on his Bach interpretations his Requiem is not re-heated Bach, but is very much a work of the 20th century. Like Brahms' Requiem, which the Kreuzchor sings every year, the Dresden Requiem is sung in German. It draws heavily on Luther's translation and includes six Lutheran chorals which provide links back to Bach and the Reformation. The imaginative scoring is for three choirs (all SATB) in different locations in the church. Spatial effects are used with a distant choir of young voices representing the departed in a dreadfully moving way. The Agnus Dei is an alto solo written for the young Peter Schreier who was a chorister with the Kreuzchor at the time of the first performance. Much of the singing is a capella, but the score also uses a small ensemble of organ, celeste, trombones, double basses and percussion. It is something of a mystery as to why Rudolf Mauersberger's Dreden Requiem is not better known outside Germany, particularly when other 'war horse' Requiems are trotted out for so many routine performances. It is a magnificent and poignant work which ranks alongside Britten's War Requiem in its use of music to reflect on the horrors of war. The German text (apart from the Latin introit) is an obstacle, but finally the demand on the singers is the real barrier to performance. Mauersberger wrote the work specifically for the boys of the Kreuzchor, and there are few other choirs who meet the required standard. But the good news is that there is an absolutely first class modern recording by the Kreuzchor under its young, and very talented, current cantor Matthias Jung. The fine recording is on the Carus-Verlag label, and can be bought from the Carus web site or Amazon Germany. The Kreuzkirche was rebuilt and reconsecrated in 1955. 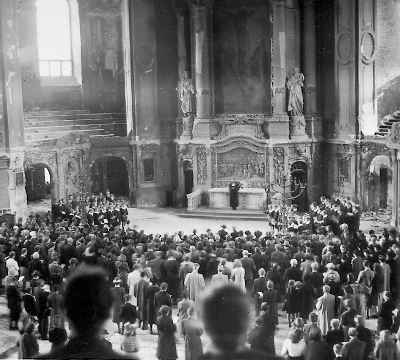 Every year since then the Dresden Requiem has been performed in the restored church. Following the performance a long procession of local people carrying lighted candles walks to the Frauenkirche. As well as remembering the dead the candlelit procession became a symbol of silent protest against the repressive East German regime until democracy returned in 1989. Rudolf Mauersberger was cantor of the Kreuzchor for forty years. It is an irony of our times that thirty-eight of these were under the tyranny and dictatorship of the Nazis and Communists, and during this time he successfully saved the choir from secularisation in the face of ideological and political pressures. Mauersberger lived to see the reopening of his beloved Kreuzkirche, but died in 1971 some years before the fall of Communism, and that other event which marked the final triumph of light over darkness in Dresden, the reconsecration of the Frauenkirche. The exact death toll from the bombing of Dresden on 13th February 1945 will never be known due to the large numbers of refugees in the city, but official estimates put the figure at more than 25,000. In the whole of the Second World War the death toll on the UK mainland from bombing of cities was 60,595, and in North America it was six. As well as the tragic loss of life in Dresden our cultural heritage suffered terrible loss. Among the buildings destroyed in the city centre by the British and American bombs were the Semper Opera House where eight of Richard Strauss' operas were given first performances, including Salome, Elektra, Der Rosenkavalier and Intermezzo, and where Wagner's Rienzi and Flying Dutchman were premiered. Also destroyed were the Königlich Sächsisches Hoftheater where Wagner's Tannhauser was first performed, and the Frauenkirche where Johann Sebastian Bach played in an organ recital in 1736, and where Wagner conducted the first performance of his Biblical scene Das Liebesmahl der Apostel, Op. 69 in 1843. * The scoring of the Dresden Requiem is 3 Choirs: SATB/SATB/SATB, 3 Tr, 3 Trb, Tb, Timp, Perc, Cb, Cel, Org. 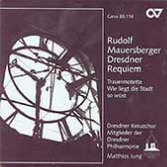 * Audio samples linked fromCarus-Verlag web site from which the score of the Dresden Requiem is also available. * I cannot trace a recording of Mauersberger's complete choral cycle Dresden (RMWV 4/1) from which the funeral motet 'Wir liegt die Stadt so wüst' is taken. Any information from readers on available recordings would be very much appreciated. - Kreuzchor from Brahms-Gesellschaft Schleswig-Holstein e.V. Pliable, thank you for these two very moving and thoughtful posts. Last night, upon my return to Washington, I privately commemorated the Dresden bombing by listening to the recording of Dresden-born composer/conductor Udo Zimmerman's 1982 oratorio, fairly recently released, entitled Pax Questuosa (The Lamenting Peace), which sets Saint Francis of Assisi, Czeslaw Milosc, Nelly Sachs, and five other German language poets. The col legno recording, made in 1983 or 1984, features Edith Wiens, Mechtild Gessendorf, William Cochran, Roland Hermann, Siegmund Nimsgern, and the Bavarian Radio Chorus and Symphony Orchestra under Udo Zimmermann. The work was commissioned by the Berlin Philharmonic in commemoration of the orchestra's one hundred anniversary, in 1982 (the year that Ronald Reagan pushed NATO and West Germany to accept more nuclear- tipped tactical weapons on it soil west of Dresden and near the Fulda gap.) The final exhortation of the Zimmerman oratorio prefigures the J.S. Bach tricentennial celebrations of 1985. Professor Zimmerman's anti-Nazi Weisse Rose (White Rose) chamber opera, with Gabriele Fontana and Lutz Harder, should also still be available on the Orfeo label. Zimmerman has been a leading figure in contemporary humanist music and experimental music theater in Dresden, Leipzig, and Berlin since at least 1970. Perhaps you could research, or mention if you readily recall, what other works were commissioned by the Berlin Philharmonic, in 1982, for the centennial. Thank you. Thanks Garth. Probably the highest profile Berlin Philharmonic Centenary commission was Hans Werner Henze's 7th Symphony. The very fine recording by Simon Rattle and the City of Birmingham Symphony Orchestra plays as I write. I should have said in the comment above that the 1982 premiere of Henze's 7th Symphony commissioned by the Berlin Philharmonic was conducted by Gianluigi Gelmetti and lasted for 46 minutes. When Henze himself conducted it the duration was 36 minutes, and Rattle takes 38 minutes. It was brave of the Berlin Philharmonic to make these centenary commissions. In 1982 an increasingly cantankerous Herbert von Karajan was still at the helm. Not the best of times for new music. Pressure of space forced a tight editorial focus on Rudolph Mauersberger in the above article. This meant I was unable to mention some of the other musical activities of the Kreuzchor. The music of Heinrich Schutz, once Director of Music in Dresden at the Court of the Prince Elector of Saxony, has held a special place in their programmes for decades, as of course has Johann Sebastian Bach. Also in their repertoire are motets by Felix Mendelssohn Bartholdy, Johannes Brahms, Anton Bruckner and Max Reger. From the 20th century there are vocal works by Guenter Raphael, Hugo Distler, Francis Poulenc, Benjamin Britten, and Krzysztof Penderecki. Concerts are performed with the Dresdner Philharmonic and the Saechsische Staatskapelle Dresden (Saxon State Orchestra) including Bach's Weihnachtsoratorium (Christmas Oratorio), and his passions, masses, and cantatas' and Ein deutsches Requiem by Johannes Brahms are given annual performances in the Kreuzkirche. For a number of years the Dresdner Kreuzchor has also worked together with specialist early music ensembles. right now school is eating me alive. But I promise, I will get to it. Emily, good luck with your work at the school in New York which you chronicle so well in your blog. I was moved to write this article because of the tragic loss of young lives in Dresden. The future of some of today's young people is in your hands, and that is very important.